Right now, Snapchat is viewed as the underground social media app for youngsters. Despite the fact the app has more than 100 million daily active users that send over 400 million Snaps every day, Snapchat hasn’t reached the mainstream level of networks like Facebook, Twitter and Instagram just yet. The app is wildly popular among millennials, but older generations haven’t caught on quite yet. 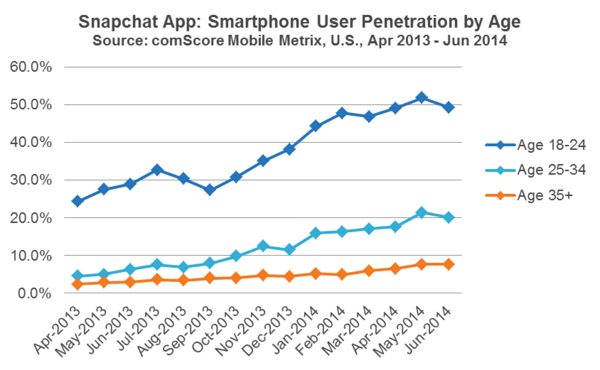 As you can see in the graph below from ComScore, nearly 50% of Snapchat’s users fall into the 18-24 age range. If your aim is to reach a younger demographic, specifically 18-34 year olds, then Snapchat is the place to be. Not only is the app growing quickly, but the users are extremely engaged. In fact, 65% of Snapchat users upload Snaps. The challenge with Snapchat marketing is figuring out how to use the app in a way that engages users and drives action without being overly promotional. Even though the app has been around since 2011, Snapchat marketing is still very new since the app didn’t take off until 2014 and 2015. With all that being said, there is plenty of opportunity to mix Snapchat into your social media marketing strategy. We’ve seen companies like Audi, GrubHub and the NBA have success, but how can you achieve similar results with your own Snapchat marketing campaign? Instagram vs. Snapchat: Which Is Best for Your Business? The very first thing you have to know about Snapchat is that it’s unlike any other social networking app. The main feature of Snapchat is the time constraint put on the content you share. While Tweets and Facebook posts are archived and can be accesses at any time, a Snap will expire. When you’re sending a Snap to a friend, it self destructs once it’s viewed. But the way most brands use Snapchat is by taking advantage of the Story feature. With Snapchat Stories, you can combine a series of Snaps together to create a longer piece of content. The advantage of Stories is that your followers can view them as many times as they want within 24 hours. But after that viewing period, the story is gone. That time restraint opens the door for all kinds of creative marketing campaigns, which we’ll talk about in a little bit. One similarity between Snapchat and apps like Instagram and Vine is that spontaneity is important. These apps are used to capture moments in time. This means you don’t have to necessarily plan out what you want to post. It’s more about feeding off what’s currently taking place. Snapchat just takes that concept to an entirely different level with the self destruct feature. Let’s say you have an event coming up. You might post Instagram photos of your team together or make a short video clip of what happens behind the scenes. But you could make a Snapchat story of all of the brief moments that occur throughout the day—like the seconds before you go on stage to present. The other difference with Snapchat is having the ability to draw over your images or videos. This gives you free range to make your Snaps stand out and be much more entertaining than the pictures you you might have posted on Instagram or Facebook. The key takeaway from this is that your approach to the content you put out on Snapchat should be different than the way you create Tweets, Pins and other social media content. Both consumers and companies have a tendency to only present the best images of themselves on Facebook, Instagram and other social media sites. From its inception, Snapchat set out to break that trend. For marketers, that means humanizing your brand. Users don’t want to see Snaps of professional product photos or team pictures that look like stock images. Users want to be entertained by the unique content you share. You’ll notice that some of the most popular brands on Snapchat post Snaps and Stories that have nothing to do the company itself. This is because they understand the culture of the app. Don’t think about what your company can get out of each Snap. Be real, genuine and entertaining. Now that you have an understanding of what makes Snapchat different, let’s talk about how you can use the app as a part of your social media marketing strategy. The most obvious marketing idea for Snapchat is to give your followers exclusive promotional offers. Since stories expire after 24 hours, it gives you the perfect opportunity to host flash sales or send out coupon codes. 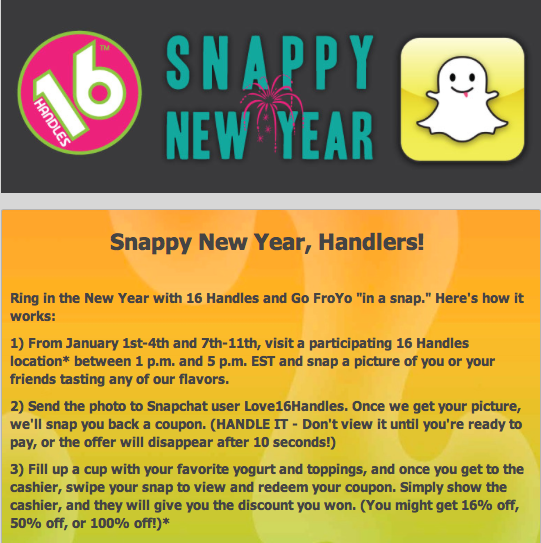 One of the most popular examples of a company using Snapchat for discounts is the frozen yogurt shop 16 Handles. In 2013, the company created a campaign for the New Year, which offered discounts for customers who sent a Snap of themselves enjoying 16 Handle’s yogurt. Snapchat is based off of short clips. Creating a series of Snaps or even Stories to build up anticipation for an event or product release can help spread the word organically, and even add a viral element when done correctly. 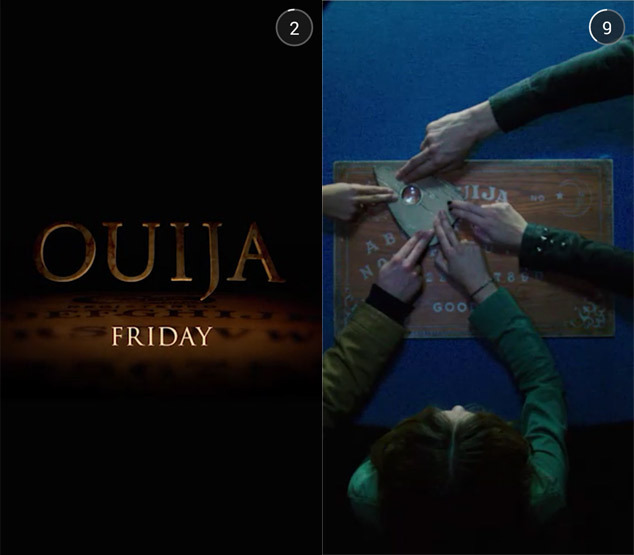 Universal Pictures used this technique with the movie “Ouija.” By combining sponsored Snaps with a short trailer of the movie, Universal Pictures spread the word about the upcoming movie with its target demographic. A creative way you can use this technique is to send out a short 10 second Snap to select people. You’ll want to target influencers and brand evangelists. You could also choose random followers to for a special inside peek, similar to Willy Wonka and the Chocolate Factory’s golden ticket idea. If there’s one company that understands Snapchat marketing, it’s GrubHub. Its app finds local restaurants and lets you order delivery or pickup online. The company uses Snapchat to do everything from finding new employees to giving followers a behind the scenes look. And one of the most popular things GrubHub is known for is giveaways. 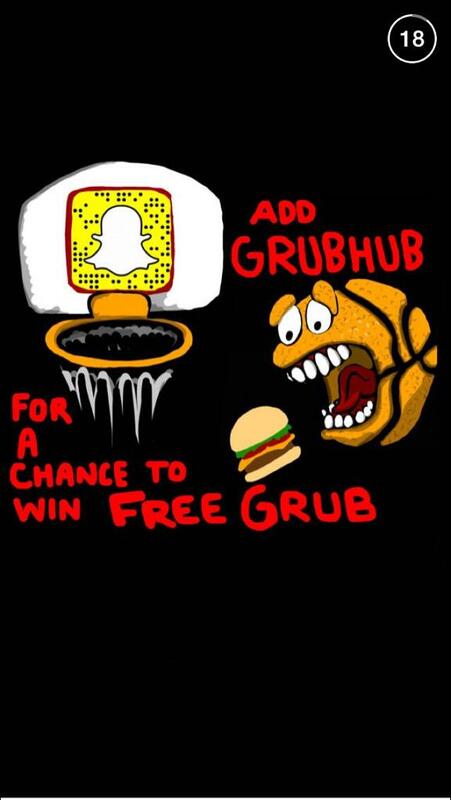 Earlier this year, GrubHub launched the #SnapMadness giveaway, which rode the March Madness wave. Snapchat is a great tool to use for giveaways because you can directly engage with your audience. In the GrubHub example, users got to send entries to GrubHub, and the company replied directly to them. That level of one-on-one interaction makes it a more personal experience. Think about creative ways you can use giveaways to engage your audience. Throughout this entire post we’ve been mentioning how brands can benefit from Snapchat Stories. While some brands create stories from random photos and videos taken throughout the day, a more powerful approach is to make a more traditional style of story with a beginning, middle and end. Here’s an example of a story from one of the most popular Snapchat users, Sallia Goldstein. Notice how each Snap transitions into the next, and there’s a complete story line. You can use a similar technique to keep fans engaged with entertaining content. Brainstorm an idea for a story, map it out on paper and then start creating. Remember, your stories don’t have to feature your products. Get creative and think outside the box. Another unique aspect of Snapchat that gets overlooked is the easy integration of images and video. You’re not limited to creating Stores that are just a slideshow presentation or one long video. You can combine both of these visual elements into one and have it transition smoothly. Here’s an example of how Nev Schulman from the MTV show “Catfish” combined still pictures and videos into a promo for his upcoming episode. Push the envelope even further by mixing in additional artwork and graphics like Schulman did to spruce up your stories with color and eye-catching graphics. Just be careful not to focus so much on adding these little extras that you sacrifice quality. Snapchat Ads are still in its early stages and isn’t available to everyone just yet. But it does look very promising. One of the main benefits of Snapchat Ads for marketers interested in mobile advertising is the fact the ads take up the entire screen of the mobile device, so they’re not an afterthought like what you get with other platforms. Also, since users can skip the ads, they’re a lot less invasive as well. The real question is do they work? There isn’t a lot of data out yet, but in one case study for the “Furious 7” movie, people who saw the short Snapchat ad were three times more likely to watch the movie than those who didn’t see it. The trick to being successful with Snapchat Ads is keeping your Snaps short and immediately engaging. 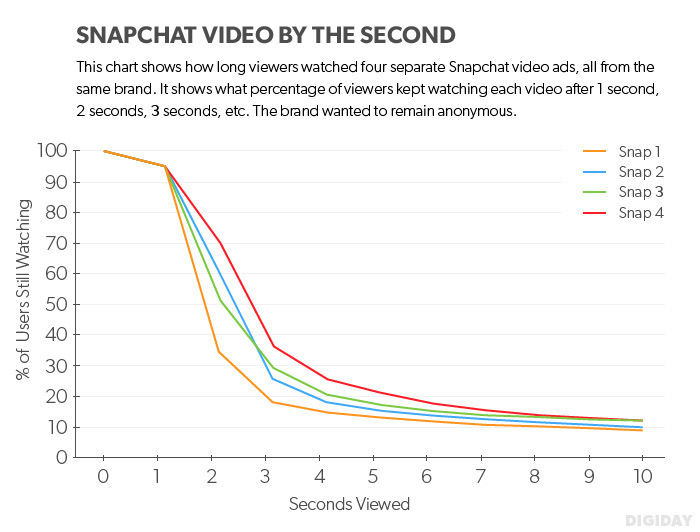 As you can see in the chart below of a case study presented by Digiday, the percentage of people still watching a Snapchat Ad drops dramatically after two seconds. If you’re interested in testing out Snapchat video ads, here’s the inquiry form to get more information. The best time to get active on a new social media site or app is in the early stages. Snapchat has only been around for a few years which is still early for a social media app. That means it’s much easier to stand out and solidify your brand. In case you need even more of a reason to start using Snapchat, expert social media marketer Gary Vaynerchuk predicts that it will be one of the top three platforms for people between the ages of 13-50 in 2016. Don’t miss this opportunity. Download the app and start Snapping!